Am I Smart Enough To Not Be Too Smart? Question: It is said that it is not the smart one who learns in Kabbalah. Then, why do you always ask whether we understand anything we learn in The Study of the Ten Sefirot? Isn’t The Book of Zohar enough for those who only have to feel? Can smart people really study? Answer: Interestingly, spiritual advancement doesn’t depend on the knowledge we accumulate. This is clear and certain. The point is that apprehension and comprehension, knowing, comes when I put effort into unity, into the desire to connect with our neighbors, and getting outside ourselves, when we convince ourselves that the visible picture around us is in fact my world, part of my soul, and my enemies and adversaries are the most useful and closest to me. In turns out that the opposite is true. On one hand, our advancement depends on it. But on the other hand, we see that the Ari started to explain Kabbalah as if it were science in the contemporary meaning of the word. It was the Ari who opened the era of correction to us; it starts with him. In the 16th century, he added a scientific nature to Kabbalah; he started to present materials in a scientific way and for the first time ever he accurately described the structure of spiritual worlds, Partzufim, Sefirot, Lights, vessels, laws, degrees, etc. After the Ari, several Kabbalists wrote such books, then, Baal HaSulam appeared and continued the same trend; based on the Ari’s books, he wrote The Study of the Ten Sefirot. It is a full tutorial with precise definitions and responses to numerous questions. In addition, he wrote a commentary to The Book of Zohar using scientific terminology. Why do we need this? Maybe, it’s indeed enough to read the Torah with all those stories of exiting Babylon and Egypt and other events of ancient history? Yet, it is obvious that we have no clue about what exactly is described in them. When materials are presented in a scientific way, it becomes very clear to us that we are dealing with the process of approaching the Creator; whereas, when reading the Torah, we simply cannot locate our place in all these stories, nor can we sense the need for our internal changes or determine the means to do so. This way of presenting materials was very good for the period when people were seeking the Creator through affliction. We should keep in mind that in the era of the Torah, the Prophets and Holy Scriptures, the Creator could be attained as a result of pretty simple efforts, as it is said: “Eat bread and salt, drink water, sleep on the ground, suffer, and engage in the Torah.” If one read the source, the Tanakh, following the above conditions, wanting to come to the Creator through the reading, one attained Him. But then the egoistic desire “jumped” to the next level, and from this stage on, the former method of revealing the Creator became impossible. That’s why Kabbalists started to search for a different form of presenting materials—in the form of Mishnah and Talmud. These books speak of the same things that are described in the Tanakh, but this time in the context of laws. Things that the Torah explains in the form of morality were framed in the Talmud as a rigid structure: We take and give; if we take something, we owe the same thing back, thus, we either go through afflictions or are entitled to a reward. In principle, the wisdom of Kabbalah talks about the laws of interconnection between the vessels and the Lights. The power of the Light of Infinity (Ein Sof – ES) is unchanging, although there are five spiritual steps. At the first stage, the Light goes through without any filters (directly) and is called Yechida. At the second level, the Light goes through a specific “filter” that lowers it to the level of Haya. 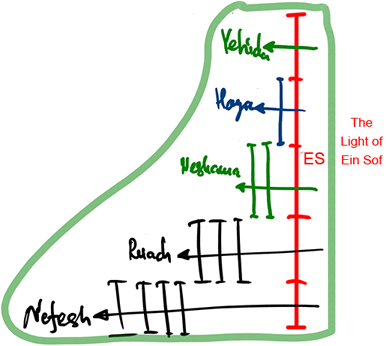 At the third step, two filters lessen the Light to the level of Neshama, and so on and so forth until it reaches the level of the Light of Nefesh. Many other laws act in this system, but the main thing is the relationship of the Lights and vessels. This is what the entire wisdom of Kabbalah is about; there is nothing else to it. It can be described in various ways. The authors of The Book of Zohar use their own method of presenting the material, the language of morals. From the time of the Ari, a rapid development of science and technology began; new generations required different scientific languages. But, in fact, the Ari wrote about the same things—about the relationship between the Lights and the vessels, about the laws that act in this system. We also study the worlds, Partzufim, the steps, in other words, the desires that have the screens and the corresponding Lights. There is nothing besides them anyway. Thus, on our way to correction, we become more meticulous with the laws. For example, if my TV set doesn’t work, I explain what’s wrong with it using my sensations. I say, the colors are wrong: There is too much red, not enough green, and no blue at all. Yet, when a specialist steps in, he says: We need a special lamp that has certain characteristics in watts and lumens; we also have to solder this relay to that part. When we go deeper inside, we start “playing with numbers,” with technical specifications. If one wants to talk about spiritual steps, he has to explain in detail what state he is talking about, what level, what desires, what screens, what Light. One has to use numbers that show me what he is talking about. Vague definitions do not work. The same applies to modern day technologies; it requires ever greater accuracy in measurements settings. So, whether we like it or not, the scientific language of Kabbalah is closer to us, although we still cannot tell what’s behind it. Let’s say, yesterday you were in one state, and today in another. -“What is the difference between these states?” I ask. We have to unite with the general system, but how? How can we unite if there is no channel of connection that works at the ultimate frequency and that provides an ideal exchange of information? Consequently, we have to become experts and know our “TV sets” properly, then we begin understanding the entire system. The system is ours. It is us! The question is: What are the methods of acquiring this knowledge? Question: The school teacher told me that one plus one is two. I believe him, but then start checking it out. Do we apply the same method here? We begin acting in a completely different plane of reality that is still hidden from us. Why is it hidden? It is because it doesn’t correspond to our current sensations or intellect. It makes it impossible to apply conventional mathematics to the spiritual world. It means that the one who is prone to changing one’s own properties is able to study, as opposed to the one who is smart and clever. As a result, our modified qualities “dress” into a new type of intellect. A person changes his desire and receives the “revelation” into it. This is an intellect of a higher level. One shouldn’t be “smart.” On the contrary, a person has to cancel his current understanding and go against it in order to receive a new type of consciousness. One has to be smart enough to cancel one’s present understanding. How do we do that? We have to understand only one thing: We need to depend on the correct environment and over and over again continue receiving its integral mind instead of having a mind of our own. In this world, this approach looks totally unacceptable, whereas in spirituality, everything is exactly as it is described above: We unite with our very special group. The Creator brought us here and told us: “Unite with your friends.” We neutralize our mind and sensations and start uniting. How possibly can we agree to this? It is so hard to bow our heads and “loose ourselves” in the group. We are brought to this state from Above, although we are still concerned whether we are capable of self-annulment. That is the question. Do we accept the destiny that is offered to us by the Creator? Do we run away from it? Do we continue using our energy in spite of everything that goes on with us and manage to put our mind aside? Kabbalah is a difficult labor. It’s an exertion that influences our nerves, habits, and desires. It has nothing to do with the amount of knowledge.